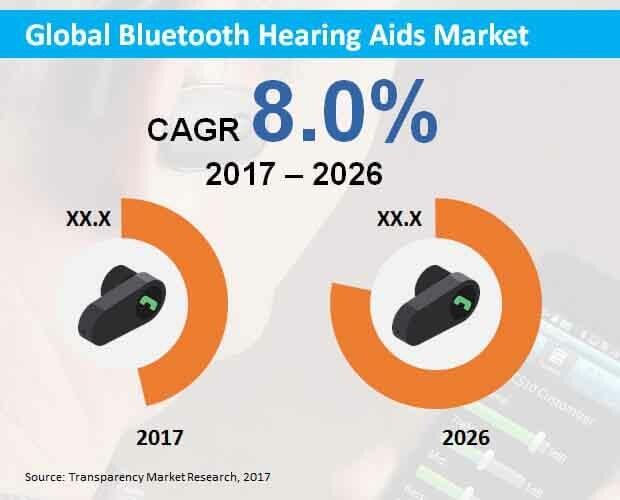 A new report by Transparency Market Research (TMR) has identified key players actively contributing to growth of the global Bluetooth hearing aids market. The report has explored the market players in detail and has tracked their occupancy through an intensity map. Key market players profiled by the report include Widex A/S, GN Store Nord A/S, William Demant Holding A/S, Medtechnica Orthophone, GN ReSound, Eartone, Union Hearing Aid Centre, Starkey Hearing Aids, Siemens Healthcare, Shenzhen Sunsky Technology, Persona, Miracle Hearing Aid Clinic, Beltone, MED-EL, Cochlear, Sonova Holding AG, and Sivantos Pte. Ltd.
For hearing impaired patients, burdened by high costs of hearing aids along with unhelpful insurance companies, Bluetooth hearing aids are becoming the game changer with provision of highly sophisticated features. Primary aim of hearing aids has forever been making improvements in speech understanding. In a bid to accomplish this aim, several hearing aid manufacturers have commenced incorporating Bluetooth technology in their advanced hearing aid’s microchips, in order to make speech from devices such as televisions and phones more accessible to the hearing impaired. In addition, built-in microphones in novel Bluetooth hearing aids developed recently enable automatic voice pickup, helping people to make two-way conversations via their hearing aids. Developments in Bluetooth hearing aids have enabled multiple devices capable of being paired to a single streamer, which in turn facilitates switching between different devices. A great example of this is the ability of being connected to a mobile phone while streaming a movie in a tablet. Streaming via Bluetooth hearing aids has enabled numerous other benefits to patients such as personalized hearing experience, remote control of hearing aids and standard protocol. Unlike traditional Bluetooth devices, technologically advanced Bluetooth hearing aids deliver customizable amplification for audio streams coupled with better speech understanding in various listening environments. The market for Bluetooth hearing aids is projected to register the fastest expansion in Asia-Pacific excluding Japan (APEJ), trailed by North America. In addition, the market in Europe is projected to record a CAGR nearly equal to that of the market in North America through 2026. However, North America will continue to account for the largest market revenue share during the forecast period. In contrast, Middle East & Africa is anticipated to account for the smallest revenue share of the market during 2017 to 2026. On the basis of product type, behind-the-ear (BTE) hearing aids are anticipated to remain leading revenue contributor to the global Bluetooth hearing aids market. In-the-ear (ITE) hearing aids and receiver-in-the-ear (RIE) hearing aids will remain fast expanding products in the market. These products are also expected to remain major revenue contributors to the market, trailing the BTE hearing aids. Based on patient type, adult segment will remain dominant in the market, in terms of revenues. More than three-fourth revenue share of the market is poised to be held by adult patients with hearing impairment during 2017 to 2026. However, sales of Bluetooth hearing aids for pediatric patients are slated to register the highest CAGR in the market through 2026. Hospitals are anticipated to be the largest end-users of Bluetooth hearing aids, with revenues projected to account for roughly half share of the market by 2026-end. Clinics will also remain lucrative end-users of Bluetooth hearing aids. Sales of Bluetooth hearing aids in hospitals and to individuals are slated to record a similar CAGR through 2026.